Noticing New York: Hillary Clinton’s New National Campaign Office Next to the Tillary Clinton Brooklyn Heights Library: Why Everyone’s Talking About Income Inequality From An Economy That Supports the 1%. Hillary Clinton’s New National Campaign Office Next to the Tillary Clinton Brooklyn Heights Library: Why Everyone’s Talking About Income Inequality From An Economy That Supports the 1%. Why would Hillary Clinton locating her new national campaign office next to a local library, albeit probably the second most important library in Brooklyn, resonate in the discussion of issues in the 2016 presidential race? It has to do with income inequality and the fact that the library she has located next to is being targeted to be sold and vastly shrunk in a real estate deal to create a tower of luxury condominiums and to benefit, at public expense, an elite private school. There’s a lot more to explain what might stoke the potential resonance of this fact in the discussion, but first, let’s have some fun with names. Back when William Jefferson Clinton was in office as the president beloved by Democrats (and with fairly high approval ratings generally), liberal New York City Councilman Tom Duane, who went on to become a state senator, used to like to boast that he represented the district of “Chelsea Clinton” invoking the name of the president’s daughter. Duane is from one of the oldest esteemed families of New York for which a downtown Manhattan street and park and Duanesburg in upstate’s Schenectady County near Albany are named. James Duane was mayor 1784–1789. In turn, Duane Reade, the ubiquitous drug store chain, takes its name from that Manhattan street, the chain’s original store having opened on Broadway between Duane and Reade Streets in Manhattan. Now there is another confluence when it comes to Clinton family names and the New York area. It also involves street names. . . and the library. It turns out, the prime spot in Brooklyn where Hillary Clinton just recently announced she is locating her national campaign headquarters right next to, cheek by property-line jowl, adjacent to the key Brooklyn destination library that’s getting a lot of attention because it is under siege from coveting New York real estate interests. As noted, those interests want to turn the public’s library into a luxury condominium tower, with a vastly shrunken “replacement” library underneath. The library stands at the corner of Brooklyn’s Tillary and Clinton streets. . . or, if you want, where on the grid Tillary Street transitions seamlessly via the curve that hugs the library to become Clinton Street. That’s right! Hillary Clinton’s new national campaign office is located right next to the Brooklyn Heights Tillary Clinton Library. Cementing the nexus further, the building in which her campaign office stands has actually, with a scheme of partially combined ownership, been made part of the same zoning lot with the library, and, as we will discuss here, that means there is even more that connects presidential candidate Clinton’s office with the Tillary Clinton Library. 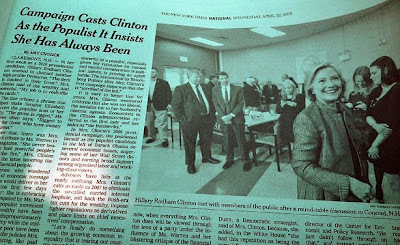 One of a string of reporters on April 12th who lined up outside the new Clinton national campaign office to report on Hillary's declaration that she's running for President. It was fun how they politely took turns using what was considered the best spot. It’s public land and public facilities and public land under threat. . . and once again we see, lurking right behind the curtain, real estate developers who are very anxious to get their hands on these valuable properties. The Deck is Stacked in Favor of Those at the Top According to Clinton. . . The night Clinton’s video announcement came out John Oliver on his HBO “Last Week Tonight” lambasted it for anti-climactic contentlessness. He asserted it contained no more than “exactly four relevant words: I’m running for president,” telling his audience that there was “nothing else to see, nothing else to talk about” in its 2 minute 18 second length. In doing so Ms. Clinton invoked not only that growing income and wealth inequality plaguing the nation, but also acknowledges how that inequality flows from the way that living life in America is rigged to favor those at the top. Only one thing that makes this statement less striking . . . everybody, and I do mean everybody, is saying the same thing. 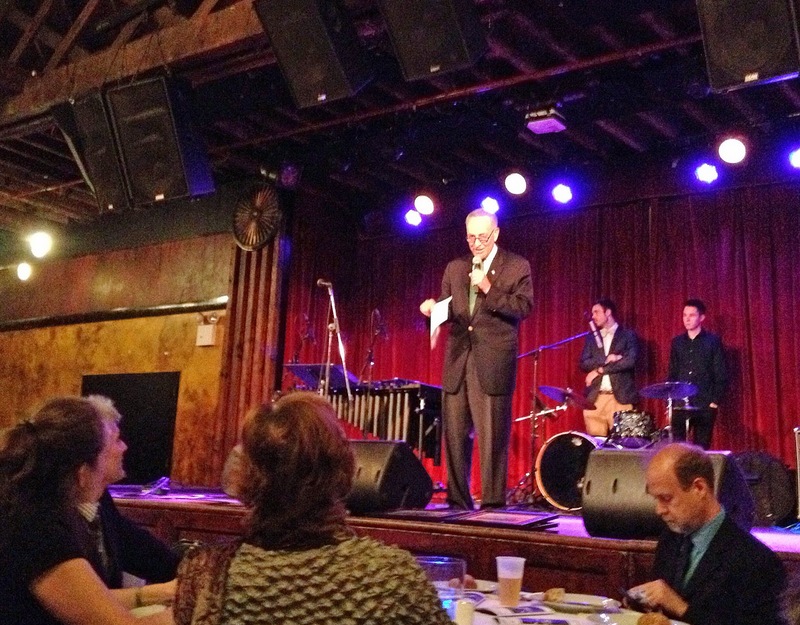 April 18th Charles Schumer, senior senator for New York, was saying it at the Central Brooklyn Independent Democrats 46th Anniversary Dinner (where he was also saying he was not sure that he was in a position to lobby his wife, Iris Weinshall, Chief Operating Officer at the NYPL, not to sell off some other New York City libraries like the 34th Street Science, Industry and Business Library completed with a contribution of federal funds in 1995). Senator Schumer at the CBID dinner (above) speaking about how the primacy of income inequality as an issue and saying that he did not think he could lobby his wife, NYPL COO Iris Weinshall, not to sell the Science, Industry and Business Library (below) completed with federal funds in 1995. The Science, Industry and Business Library completed with federal funds. The "Bridgegate" indictments of New Jersey public officials under Section 666 are predicated on the fact that public assets managed by the Port Authority were paid for with more than $10,000 of federal money. 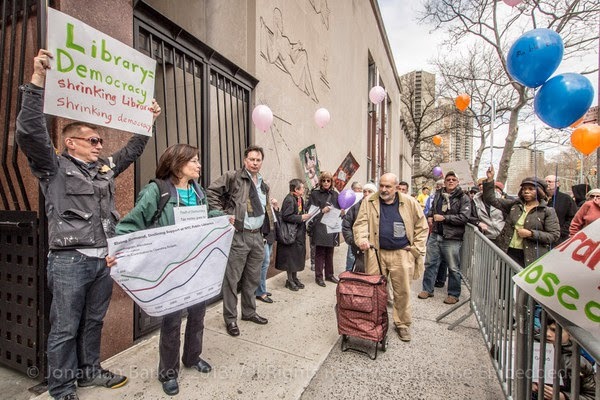 When Mayor de Balsio stood with Citizens Defending Libraries opposing the sale of the New York Libraries he was running a “Tale of Two Cities” campaign for city-wide office that was about economic inequality. He is now talking about the crisis of income inequality as being a national concern of utmost importance for Hillary and the other national candidates to talk about. De Blasio has not yet endorsed Hillary for president. It’s pretty certain that doing so immediately would not have garnered much attention given that de Blasio worked his way up the political ladder working for Ms. Clinton as campaign manager when she ran fifteen years ago to become U.S. senator from New York. De Blasio also chose tp associate himself with the Clintons by being sworn in by former president Bill Clinton at his January 1, 2014 inauguration. WNYC’s morning host Brian Lehrer proposed what he termed a “conspiracy theory,” that de Blasio’s current non-endorsement of Clinton is a bit of kabuki theater, “comfy” “coordination” to avoid the appearance of a “coronation.” The de Blasio endorsement of Clinto will therefore come later and with more drama, perhaps a to achieve some other balance in the news cycle. 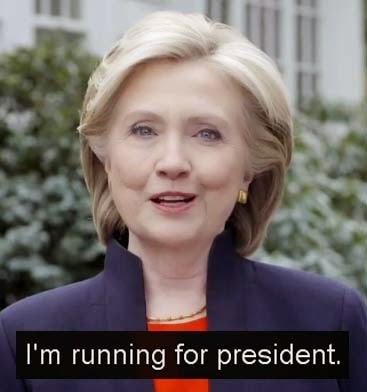 In the meantime, de Blasio will makes a show of pulling Hillary to the left with demands for `more policy detail’ and assurance of her commitment to issues about which the electorate cares. That’s all more than likely. WBAI host Jed Brandt and executive editor and publisher of City Limits Jarrett Murphy conversing in an interview April 23rd on WBAI’s “Morning Show” suppositioned that in the 2016 election the Democrats will be using “de Blasio’s position as a Liberal Progressive running a big city to put forward a national vision for urban areas” with de Blasio “charting a new vision for cities .” The new vision includes attacking economic inequality. “That’s why he was in Iowa this weekend,” commented Murphy. I'm looking for every opportunity to address what I think is the crisis of our times, which is income inequality, and growing, rampant income inequality at that.. . . And I think it's the kind of thing that should be talked about by all the presidential candidates. . We are in a different economic reality . . the reality of an economy that is basically supporting the 1%. . . you could argue that unless something really jolts the political dynamics of this country this status quo will continue for years where the rich get richer and most people fall behind. You can have much greater income disparity going forward, and I think that destabilizes the nation. . . this is a serious crisis that has gone under recognized and under addressed. I think it is absolutely fair to say to any candidate: Show us your plan and your vision before we can make a decision on who to support. Other pictures of what the Tillary Clinton Brooklyn Heights Library looks like are available here. What the building that would replace it would look like can't be said, because no real designs are available although a developer was "selected." Millions of our fellow citizens across the broad middle class feel as if the American Dream is now out of their reach. .
that our politics are petty and broken; that opportunities are elusive; and that the playing field is no longer fair or level. Bernie Sanders . . Same Issue, but There First? Populist Elizabeth Warren may not be running but senate independent Bernie Sanders, a professed Socialist, says he will be challenging Hillary Clinton for the Democratic nomination. His platform? : He has been talking about the gap between rich and poor longer than anyone. If Everybody Is Talking, What Are They Doing? So, there is no question that at this point everybody is going to be talking about escalating income inequality as a crisis. The question is who is it credible to believe will actually take steps to effectively address the way that opportunity and fairness is vanishing from the playing field that increasingly tilts more toward already privileged insiders with an inside track? The best selling point the Republicans have in this regard is that they would do the best job to fend off the kind of big government that will take your money away and give it to somebody else, buying things you don’t want. Their problem making that case is that when they seize the reins of government you see just as much crony capitalism as with the Democrats, or more. Need we say more than “Halliburton”? Bigger government may increase the thereat of crony capitalism, but while delight is taken in different parsings of the data, Republicans cannot exactly be depended upon to reduce government spending or the favoritism of corporate welfare. What’s more, far too often Republicans view control of government as an opportunity to privatize the functions government inherently does best. Privatize social security with a hand off to Wall Street? Really! Elected to take office January 1, 2014 Mayor de Blasio, with more than a year in office, is now perhaps furthest down the road of demonstrating what tackling the crisis of inequality and diminishing opportunity can look like, in terms of what he is speaking of. In May of 2014, following through on what he called for the year before as a campaigning candidate, de Blasio quashed the NYPL’s proposed Central Library plan which, as proposed, was going to cost the public more than half billion dollars to vastly shrink its library space and eliminate millions of books from the 42nd Street Central Library. 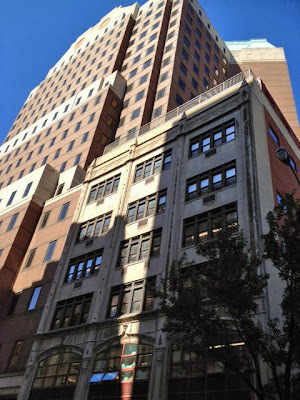 Very importantly, that plan was designed to hand-off two significant and valuable central Manhattan libraries, the 40th Street Mid-Manhattan circulating library, most used in its system, and the 34th Street Science, Industry and Business Library (SIBL) as real estate deals. There is a great deal of good news in this regard. It was tardily disclosed not long after de Blasio acted that the Central Library Plan was going to cost more than $200 million more than the NYPL had previously been publicizing when promoting it. Nevertheless, aspects of the Central Library Plan ominously survive and the NYPL, acutely aware of the public’s opposition, is obscuring facts apparently to downplay this and forestall suspicions about what aspects of the plan it might hope to resurrect in the future either under the next mayoral administration or, perhaps with persuasion, while de Blasio is in office. As noted, the NYPL still wants to sell off the recently completed Science, Industry and Business Library in a transaction that Senator Schumer’s wife, Iris Weinshall, was hired to handle after the embarrassing collapse of the first iteration of the Central Library Plan. Mayor de Blasio officially killed the Central Library plan but an example of how word is not getting out to that the public is not getting the full benefit of that plan’s be killed could be heard Thursday morning, April 23rd (1:28-1:53) on WBAI’s “The Morning Show” when David Giles from the Center for an Urban Future and Christopher Platt, the NYPL’s Vice President for Library Services, visited to make the case that de Blasio, having not restored unprecedented cuts in funding by the Bloomberg administration, is starving the city libraries, an essential service desperately in need of funding. When WBAI host Jed Brandt asked about the removal of millions of books from the 42nd Street Central Reference Library as part of it Central Library Plan, Mr. Platt trotted out a now standard NYPL obfuscation and getting away with a lie that went out to the WBAI audience unchallenged by Mr. Brandt. The collection is- ah, ah,- currently, temporarily out of the building while space is being built underneath Bryant Park for storing it. So the collections that have been moved out are coming back next year. Uhm, and all of those books will be back in central Manhattan, uhm, available for people to call, just as they’ve been able to call before. The space under the Central Reference Library’s Rose Reading Room, which was designed to hold the library’s first three million books, was cleared during the Bloomberg administration in mid-2013 with an intent to demolish the book stacks. The additional space proposed to be outfitted under Bryant Park (built twenty years ago) was designed to supplement those book stacks for a growing collection. This additionally outfitted space was designed to hold only 1.5 million books, so it is false to suggest that “all of those books,” the entire collection moved out, “will be coming back.” Only a fraction of them will. Platt’s response also ignores the larger picture of the millions of other books that have disappeared. There were once perhaps as many as thirteen million books in Manhattan’s key central libraries. That total number may ultimately be reduced to fewer than 4 million. The Donnell Library was sold. Its collection is not coming back. There were over a million books at SIBL that are gone. The NYPL’s 42nd Street Annex was sold. Previously nailed for being non-transparent about its real estate sell-off plans, the NYPL is now theoretically adjusting course and inviting comment and input from the public about what it wants. 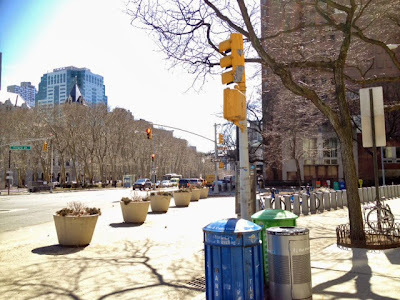 On March 26th the NYPL held a “public forum” or charrette, its very first, about what the public wanted concerning alternatives to the Central Library Plan that isn't proceeding. Nearly everyone there voiced their opposition to the sale of SIBL. Notwithstanding, less than three weeks later the public was informed, via the Wall Street Journal, that the NYPL plans, exactly as it previously intended, to proceed with a sale of SIBL . . .
. . . Does that sound like the NYPL was holding a public forum to consider public opinion, or just to be able to say they took public comment about something they already had a set intention of doing anyway? The Brooklyn Public Library similarly held a “charrette” for public input with respect to its planned sale of the Tillary Clinton Brooklyn Library on March 23rd, three days before the NYPL’s forum. Public reaction was interesting similar, with the BPL apparently similarly intent on ignoring it. The self-cannibalizing sale and shrinkage of New York City libraries as real estate deals is supposedly justified by mayoral underfunding of libraries. This was a subject that Mr. Giles and Mr. Platt entirely avoided when they appeared on WBAI. 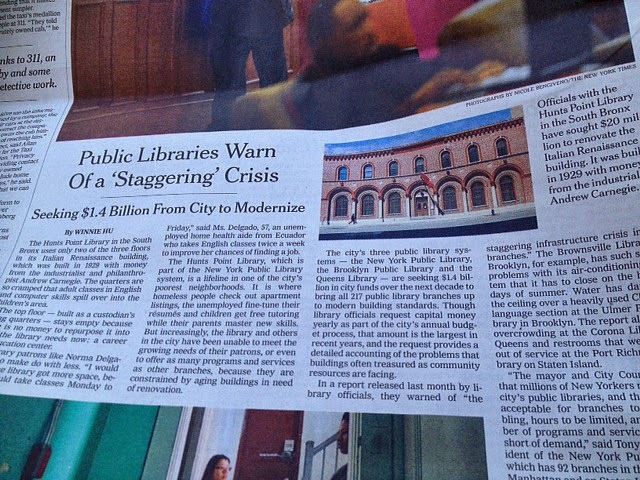 It is also something the New York Times strangely never mentioned when it similarly featured a recent article sounding the alarm about the “staggering crisis” besetting city libraries given the pitiful level to which funding for library infrastructure has currently been reduced. This was even though in 2013 the Times ran a front page article saying how the sale of city libraries was viewed as justified as an answer to this same crisis. Wouldn’t it make sense that public would want to know that the current underfunding of the city’s libraries would mean that city libraries will have to be sold off and shrunk at a loss to the public, but that if proper funding to the libraries is restored that simply isn’t necessary? In February 2013, when Michael Bloomberg was still mayor of the city, we attended a meeting about the proposed sale of the Tillary Clinton Brooklyn Heights Library where we were tauntingly told by a spokesperson for the BPL, Josh Nachowitz, that an increase in the city’s library budget would eliminate the need to sell libraries, but that we should forget about it because the Bloomberg cuts to library funding where not going to be restored. Realizing the situation that we’re in, we would all love that the [Citizens Defending Libraries] petition would be hugely successful and that we’ll get the mayor and the administration to see that a change in the way they look at funding libraries would solve a lot of this, but in the meantime we, as a library system, have to make some of the hard choices . . given diminishing resources and given the capital needs and crisis that we face . . . as [Citizens Defending Libraries] pointed out with [its] petition, the libraries are being squeezed in terms of our budget and we are in a position where we have to make difficult decisions, and unfortunately this is one of them. The amount it would take to restore the library budget and avoid these sales is relatively minuscule, a small fraction of the city’s budget, especially compared to other components. Last week New York Times columnist Jim Dwyer made this point cleverly and with exquisite eloquence. Mr. Dwyer made a point that I have made in Noticing New York before about much is being publicly spent on sports facilities like the Ratner/Prokhorov “Barclays” arena (just yards away from the Pacific Branch Library the BPL designated for sale) versus how little is being spent on libraries. Dwyer bested us however by going to the city’s Independent Budget for figures we have not cited before (although we have cited IBO figures to describe the absurdly little amount city libraries get as part of the city budget as a whole). Dwyer pointed out that in the last 8 years at least $620 million has been spent on just three sports arenas, (the Ratner/Prokhorov "Barclays" included) and that this amount was 1.37 times the amount spent on libraries serving seven times as many users. The city's libraries - the fusty old buildings, and a few spiffier modern ones, . . have more users than major professional sports, performing arts, museums, gardens and zoos - combined. 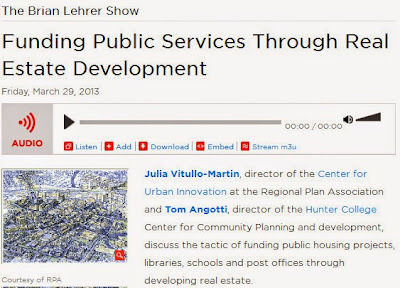 For decades, the libraries have served a single function in the city budget process: hostages. Mayors say they have to cut library hours to make the financial books balance. . .
Major museums, like the Metropolitan Museum of Art, Museum of Modern Art, American Museum of Natural History, Brooklyn Museum or Museum of the City of New York.. Performing arts, like those at Lincoln Center, Carnegie Hall, City Center and Snug Harbor. Sports teams like the Yankees, Mets, Knicks, Nets, Rangers, Jets and Giants. Natural-world attractions: the botanical gardens, Wave Hill, the zoos and aquariums. Dwyer could also have pointed out that building a new Yankee Stadium to replace the older one (for which the taxpayers had also footed much of the bill) was a transaction structured to replace local tax-paying businesses in the area with business the stadium owners would instead conduct off the tax rolls. In the case of the Barclays arena much of the benefit of subsidies mobilized for the developer are going to Russian oligarch Mikhail Prokorov. Does this dishing out of topsy-turvy benefit for sports culture boondoggles sound a little like Banana Republic style cooperate-directed crony capitalism? I couldn’t help but think of the odd skewing of expenditures this week while watching one of the latest editions of Vice on HBO. In a fifteen minute segment, “Haitian Money Pit,” it reported on what it termed “disaster capitalism” (double entendre clearly intended I think) where money ostensibly directed toward Haitian earthquake relief disappeared into the maw of lobbied-for diversions, skimming most of the cash while benefitting others, frequently U.S. companies, not the Haitians. It reported that of every dollar of U.S. government aid more than 99 cents went to non-Haitian organizations for delivery of aid, substantial amounts disappearing altogether in the process. The earthquake that forced more than 2 million form their homes was in 2010. Since that time what has the billions of dollars supplied for disaster relief provided? Homes? : Not many. Haitians whose health is imperiled by cholera and other diseases because they have no sewers and must truck in potable drinking water aren’t getting relief. Instead, in communities where basic amenities were lacking, money went to build two new soccer fields and a cultural facility, each of them little used. Two of these facilities were in a town unaffected by the earthquake seven hours north. In the vicinity of the earthquake, the International Olympic Committee built an $18 million state-of-the-art soccer field and recreational facility amidst a shanty town. The segment, featuring use of the work of reporter Jake Johnston, dings ex-president Bill Clinton, for the travesty of a wastefully useless “Zoranje housing expo” reconstruction project headed by Clinton and the Interim Haiti Recovery Commission. (The Vice reporter for the segment was Vikram Gandhi.) Elsewhere, Johnston has been a critic of the Clinton Foundation’s activities in Haiti. Why this segue focusing of sports funding getting crony capitalism benefits from government? Hillary Clinton’s new landlord in the premises next to the library is Barclays Arena owner and developer Forest City Ratner. And while it's unclear whether Clinton got a discount--or whether anyone believes that the anodyne One Pierrepont Plaza represents "Brooklyn cool"--it can't be a bad thing for Ratner (and his ally Mayor Bill de Blasio) to have a Clinton connection. When I was a senior official in the legal department of the state finance agencies, making sure that developers didn’t hand out campaign offices in our subsidized buildings was something we were on guard to prevent. In fact, in one case I remember putting the kibosh on such an arrangement where it looked like a Chelsea developer was looking to curry favor with the earlier mentioned Tom Duane, although I was myself friendly enough with Duane. In 1994 we shared eulogy responsibilities for a good friend with others, including Marvel's Stan Lee and Alger Hiss. Just as Forest City Ratner, with governmental assistance, became owner without competitive bid of the Atlantic Yards mega-monopoly of which the Barclays arena is a part, Forest City Ratner was made owner of Hillary’s One Pierrepont Plaza building in 1985, also without competitive bid. Forest City Ratner’s business model is to never do projects without government subsidy or that require competitive bid. The Ratner/Prokhorov Barclays arena was promoted as a possible location for the Democratic National Convention, probably unwisely. It wasn’t chosen. "Brought To You By Forest City Ratner?" The obvious concern for the electorate is that you don’t want your presidential candidate “brought to you by Forest City Ratner.” It is the same concern people are chewing over with respect to the Clinton Foundation: You don’t want to have your nation’s foreign policy “brought to you by the donors to the Clinton Foundation.” Similarly, even if it came with de Blasio’s endorsement, you wouldn’t want the `charting of a new vision for America’s cities’ to come you courtesy of Forest City Ratner. There is already too much of this sort of thing in politics and too much of it when it comes to Forest City Ratner. WNYC, New York City’s principal public radio station, which the public relies on to report on real estate development in the city, and which is now is now covering the presidential race intently, is now also running ads for Forest City Ratner. No this is not an April Fools' joke. (Noticing New York’s last April Fools' article can be found here and National Notice also ran one.). . WNYC & RadioLoveFest is supported by Forest City Ratner Companies, Brooklyn-based for more than 30 years while working to create vibrant communities throughout New York City. Most people informed on the topic would take issue with this controversial statement broadcast as fact: “Brooklyn-based for more than 30 years” . . . “working to create vibrant communities throughout New York City”? The “Brooklyn-based for more than 30 years” is designed to counter the perception of the firm as an interloper from Cleveland and the “working to create vibrant communities throughout New York City” is designed to counter the perception that .. well you've probably guessed. In simplest terms, when the time comes, the public ought to be able to believe that Hillary would straightforwardly denounce the selling of New York City libraries rather than hold back out of concern for her landlord. The city’s legal ownership of the Tillary Clinton Brooklyn Heights Library has, from a development zoning lot standpoint, been partially merged with the Ratner building that Hillary Clinton's office will be in, Ratner stands as a sort of gatekeeper to the transaction to sell and shrink the library to create the luxury condos. 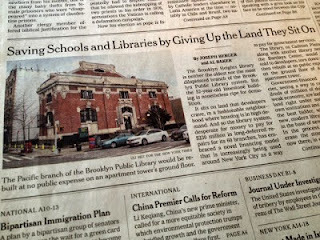 In Brooklyn, the plans to sell the borough’s libraries go back to at least 2007 when a former Forest City Ratner vice president, Karen Backus, was secretly hired to create the Brooklyn Public Library’s real estate strategy for those sales. The first two libraries that the real estate strategy created by Backus prioritized for sale as real estate deals, including the Tillary Clinton Brooklyn Heights Library, were both next to Forest City Ratner property. The other one was the Pacific Branch across the street from Ratner’s Atlantic Yards site. There is another reason Ratner stands as a gatekeeper to turning the library into a luxury tower. There is more than developer greed driving the Tillary Clinton Library sale. An elite private neighborhood school also stands to benefit mightily. The Saint Ann’s School has valuable unused real estate development rights the sale of which will be unlocked if the library is sold and shrunk. One of Saint Ann’s buildings stands on the other side of the Ratner building from the library with the Ratner building wrapping around it like a horseshoe. The only way that Saint Ann’s could otherwise use these development rights would be for the school to demolish its existing building and then rebuild to create a larger building that will utilize all of the available rights. But that would entail the costs of demolition, the costs of rebuilding and, finally, Saint Ann’s having to go without this currently used school facility for an extended period of time, still another inherent cost. Not surprisingly, it is something that, over the years, Saint Ann’s has chosen not to do. If, however, the library is sold for redevelopment, then all those sorts of costs are off-loaded and borne by the public and the library instead of the private school. The school nevertheless coasts in, incurring no such costs, but collecting on the entire benefit of using its previously locked-up development rights. It can take that benefit either in cash or by being given additional built-out property for its campus. The developer is discussing giving the school a combination that will include both. Clearly, Saint Ann’s saw a payday, and in connection with the sale and shrinkage of the library it is looking to launch a fairly substantial upgrade of other of its facilities when the money flows in. The school has influence. Quietly, and escaping public notice, Saint Ann’s promoters have, in conflict of interest situations, been pushing the library deal forward in the community. In contrast, Hillary Clinton is renting “more than 80,000 square feet of space” for her offices, two full floors of the adjacent Ratner building. Reason the Library Is Being Shrunk? It's an Essential Part of the Shell Game. Why shrink the library? And why shrink it so much? Why not enlarge it? Once it is at the base of a condominium tower it will never be possible to enlarge it again. Of course one reason to shrink the library is that its better for the developer in that the public is handing over just that much more of its development rights. Is another reason that the owners of the developer’s luxury apartments will be less nuisanced if the proletariat patronizes a smaller, less noticeable library? The library is on the border of Brooklyn’s downtown and Brooklyn Heights. (Some consider it “more a part of Downtown Brooklyn.”) Brooklyn Heights, once much less so, is now a highly gentrified neighborhood. One thing that is coming out is that some in the now gentrified Brooklyn Heights are not that tolerant of having certain kinds of visitors from other neighborhoods. What is actually the most important reason library administration officials decided to shrink the library is not an immediately apparent one. The sale and shrinkage of the Brooklyn Heights Library is modeled on the sale and shrinkage of the Donnell Library. Both were conceived at almost exactly the same time, going back to 2007, or not long before. In 2007 the NYPL sold the 97,000 square foot Donnell Library to net less than $38 million. Eventually there will be a replacement library of less than one third the size, 28,000 square feet. Even though the developers and related real estate interests involved in the Donnell sale are doing unspeakably well, the NYPL realized so little from its sale of Donnell (at the very top of that year 2007 real estate bubble) that it would have suffered a net loss if it were building a full scale replacement for Donnell. It ought to be noted that much of the previous Donnell had been renovated relatively recently before its sale. The situation with the Tillary Clinton Brooklyn Heights Library is fairly similar. Without rejiggering things like the size of the library, the transaction becomes more transparent and the extent of the public’s loss more glaringly obvious. As is, the Brooklyn Public Library has refused to provide calculations of those losses such as would be suffered implementing the prospective shrinkage. The space is definitely desirable for its central, easily accessible location, accessible to all of Brooklyn and the most of the rest of the city as well. It's accessible to numerous transit lines. So you have the Jay Street hub, you have the Borough Hall hub, the subway lines. You have Clark Street, Court Street, High Street, all of these different subway lines are serviced at this location. There are parts of Manhattan that are not as well serviced as this particular site and you're able to get to downtown Manhattan within minutes. The BPL has another explanation for why it is shrinking the Tillary Clinton Library and it runs opposite to why Hillery Clinon is seeking to locate next to its central location. Integrated into the library are “Business and Career Library” functions and the BPL is arguing that it would be beneficial to the public to extricate and exile these functions away from what the public officials, bragging about the desirability of the site to developers, describe as a “nexus” with the adjacent “financial hub of Downtown Brooklyn,” theoretically moving them to the Grand Army Plaza Library next to the northern tip of Prospect Park and the Botanic Garden. Notwithstanding the proposal to exile these functions, according to the BPL the business and career library functions have been located "in the commercial hub of Brooklyn since it opened in 1943." In 1991 the BPL spent a considerable amount, millions, about $10 million by today's standards, for an "extensive" renovation and enlargement of the building, expanding its second floor, part of the purpose of which was to give which was specifically to better "accommodate the business library" with more space. As recently as 1997 the BPL was, speaking of these renovations, telling the public in its rhetoric of the time: "[t]he Business Library looks forward to serving Brooklyn's business community into the 21st Century." 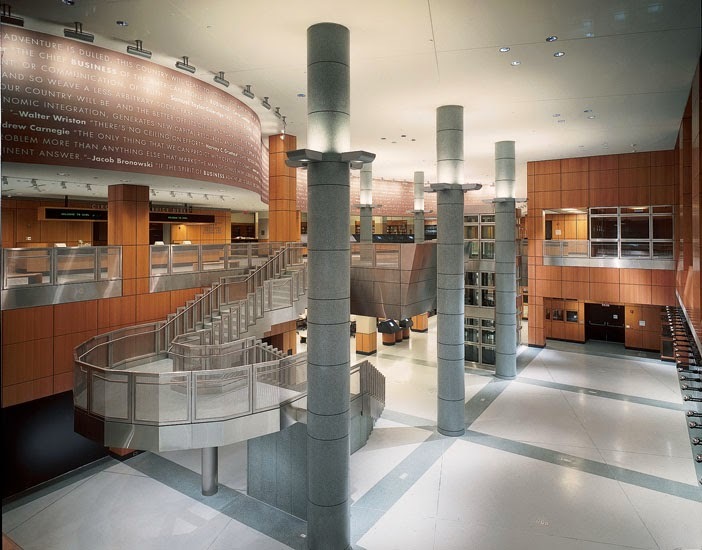 43% of the existing 63,000 square foot Tillary Clinton Library is devoted to Business and Career functions but no new space would be added to the Grand Army Plaza Library as and when these functions are theoretically shifted and crammed into the Grand Army Plaza Library location. That’s to the extent that those functions will really continue to exist there at all. Some space devoted to the functions will probably simply disappear entirely with the BPL saying it was space the public simply doesn’t need to have. 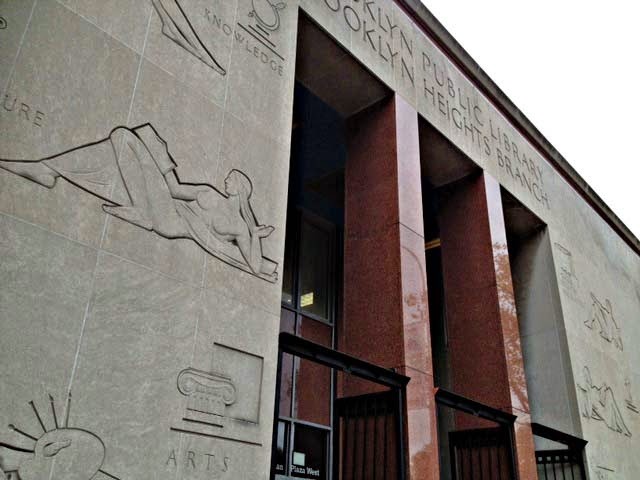 The BPL has acknowledged that a reorganization to jam the function into the the Grand Army Plaza Library will require physical alterations that involve considerable expense, but BPL president Johnson refuses to release a figure for this expense to be netted out as a public costs from the relatively small amount the BPL will be paid by the developer getting to demolish the Tillary Clinton Library. Johnson says that she does not have to consider or net out the cost of moving the Business and Career Library because the BPL had decided to move it anyway, that it was “in the works” before the sale so that it is not really a part of the transaction that is shrinking the Tillary Clinton Library. That’s not what the BPL’s record shows although Johnson says emphatically that it was “not the case” that this was always in conjunction with the sale. reminded the Board of past conversations about the plan and let them know that the goal was to get far enough into the plan with this Mayor so that when a new Mayor takes office, the plan will be deep in progress and he or she will not derail it. 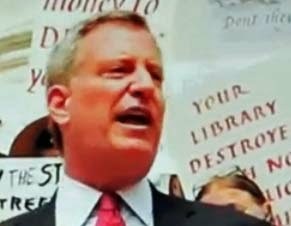 In 2011 Ms. Johnson didn’t know who the next mayor was going to be, but a shift in the polls determined that it would be de Blasio right after, in July 2013, he called for a halt to the sale of the libraries in his "Tale of Two Cities" campaign. This martini glass chart shows how growing support for de Blasio took him all the way to in an election win with that really taking off in July 2013 just when he joined with Citizens Defending Libraries in decrying the sale and shrinkage of the city's libraries. Move the Business and Career functions out of Brooklyn’s Central Business District to shrink the library? Brooklyn’s Downtown is growing fast. When analyzing population it is important to recognize that Brooklyn has at least two populations, a daytime population reflecting where people work that includes Brooklyn residents and many other constituents of Brooklyn for planning purposes. 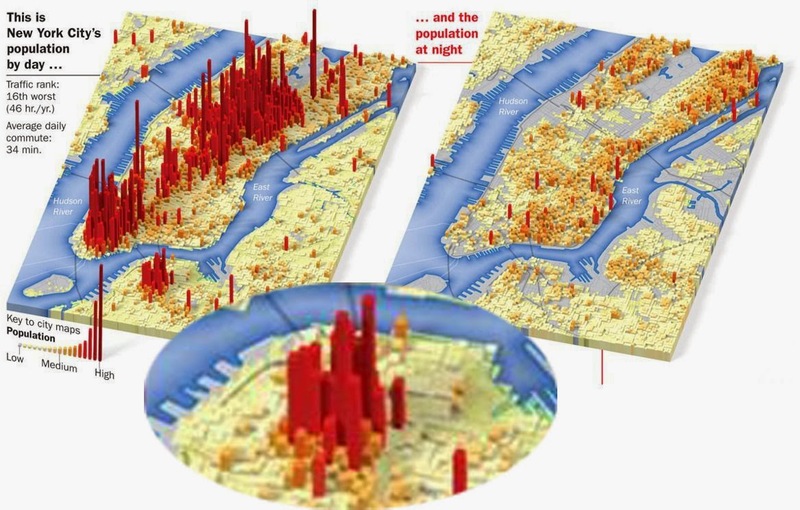 There is also a nighttime population more reflective of where Brooklyn residents sleep. There is also the those who travel through and might during their travels stop in Downtown Brooklyn. During the daytime, commuters nearly double the daytime population of Manhattan due in large part to all the commuters coming in from the Boroughs and elsewhere, with seven out of 10 commuters coming from another county. The daytime population of Downtown Brooklyn, just across the river from the Wall Street financial district similarly swells as people visit its office buildings, courthouses, schools and universities (see population map). The borough that sends the most commuters to Manhattan is Brooklyn although most Brooklynites remain in Brooklyn to work, many in Brooklyn’s Downtown.. Here, adapted from a graphic in Gizmodo, the foreground enlargement shows how the expansion of the daytime population in Downtown Brooklyn resembles Manhattan's commuter draw. That’s due to all the many towers springing up, part of the same building boom that is causing developers to crave the Tillary Clinton Library as valuable, as a place to put up one more of the towers. But that same development and escalating density that makes the property increasingly valuable to private developers makes the property increasingly valuable to the public and hard to duplicate if it is ever lost. A denser, growing city means we should be growing our public assets to keep pace, but the paradoxical irony is that when competition heats up that’s exactly when it's hardest for the public to find space and figure out where additional facilities can be squeezed in. Giving up and shrinking the assets we already have is opposite to a solution. One case in point exemplifying the city's difficulty in finding the land it needs to provide essential services is the city's inability to find and supply additional space in the neighborhood to overcrowded P.S. 8, already at 142 percent capacity. With more than 3,750 new housing units to be developed in the school zone through 2017 another tower replacing the library would only increase the escalating burden, yet nary a thought was given that if land was being taken from a library supporting the school it might be put to other use. . Actually, that not quite so: Behind the scenes its being said that a luxury is being built is because the School Construction Authority has said there isn't a good place for buses to park if a school was to be built on the site. Not true! Some people are quietly saying that a luxury tower is best to replace the library site because the School Construction Authority says the inability to park buses by the site would make it problematic to have a school there. Really? Whether it’s Manhattanites or somebody from Queens working in Downtown Brooklyn, or a Brooklynite working a few subway stops away in Manhattan, the true constituency of a public library like the Tillary Clinton Library is anybody for whom it is reasonably convenient to stop and visit the library. That includes those traveling through an area for whom a stop is convenient. . . 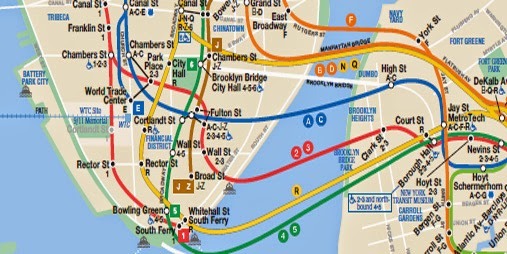 The above shows how nearly all the Manhattan subway lines converge and travel over to land in a clump by the Tillary Clinton Library in Downtown Brooklyn and Brooklyn Heights. Proportions are not quite correct. In real life Manhattan is lengthened and the subways are even more clumped together. . . . . 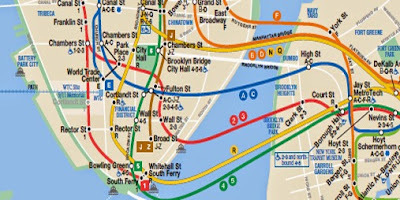 Almost all the subway lines in New York City are Manhattan-centric and they almost all travel down to the bottom of Manhattan before jumping the river to land in a clump in Brooklyn Heights and the first stops in Downtown Brooklyn. Because the Brooklyn Heights Tillary Clinton Library is where it is, almost every subway line going to or fro between Manhattan and Brooklyn stops right near it except for the L train going out to Williamsburg, but even L travelers get to Brooklyn Heights with superb ease. That’s a huge number of mass transit users passing through for whom a central destination library stop like this is always convenient. 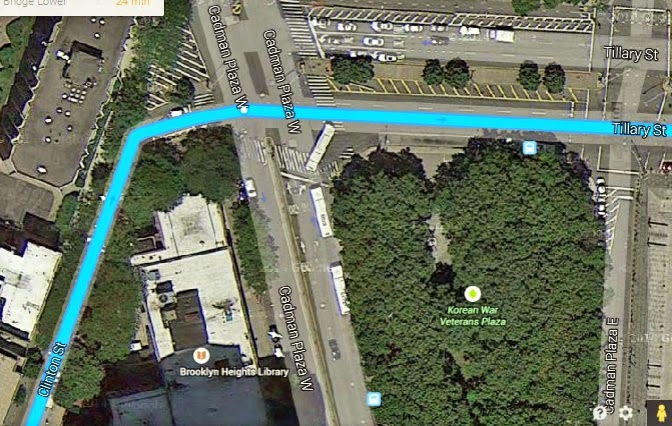 Even if you are traveling to and fro between Manhattan and Brooklyn via automobile the same sort of bottle necking applies because you are likely to use either the Brooklyn Bridge or Manhattan Bridge, turning on either of them from Tillary probably passing the library via Clinton on the way. Nevertheless, the BPL has offered as a rationale for shrinking the business and career functions out of the downtown Tillary Clinton location and moving what will remain of these services to Grand Army Plaza that it will then be more conveniently located, more convenient for those with a business focus. In actuality, even if you set aside any particular focus on business and instead adopt a Brooklyn-centric measure of accessibility, the Grand Army Plaza library despite being somewhat more centrally located in the borough is, because of Downtown’s superior transportation, not more accessible than the Brooklyn’s Downtown. It’s perhaps even less so. There’s probably a related reason that the MTA prioritized making its Downtown stations handicapped accessible and has yet to get around to the Grand Army Plaza stations. If you use the more Brooklyn-centric measure of having the location of all the various libraries in Brooklyn stand in as a proxy for where library users might be coming from in Brooklyn in about half the cases (see chart) the estimated travel is greater if a user is traveling to the Grand Army Plaza location. In about a third of the cases the travel time is appreciably greater. You can try these calculations at home. These were done with Google Maps. Because Google takes into accounts how schedules apply for whenever you do the calculations they will vary, but slightly in the overall. So, for instance, asking for a calculation at a slightly different time might get you, respectively for travel to the Brooklyn Heights Library and GAP Library, 52 minutes and 1:02 minutes from Jamaca Bay, or 37 and 47 minutes from Bushwick, 36 and 40 minutes from Washington Irving Library, all of which are results that turned up in when I tried again at a different time. Under the original traditional scheme of things in the city, users had a choice of centrally located destination libraries to go to and could make their decision based on convenience. That was similarly the case with the NYPL where you could choose to go to the Donnell Library, the Science, Industry and Business Library, or the Mid-Manhattan Library. When the NYPL and BPL adopted parallel plans to sell libraries they came up with a concept of consolidating shrinkage collapsing the fuller services of destination libraries into the fewest locations while elsewhere there's be only smaller libraries, places where patrons could run in to pick up orders books without browsing. The NYPL Central Library Plan and the sale of the Brooklyn Heights library to collapse surviving functions into the Grand Army Plaza are both examples of such consolidating shrinkage, but for elected officials who want to be alert and stand with the public to fend off all such disasters, it should be noted that other consolidations have been talked about, with the NYPL mentioning its next, still undescribed parallel plans for “Northern Manhattan” (Harlem?) and Staten Island. Resulting space reductions tend to be down to between only one-third to one-quarter of the amount of space that previously benefitted the public. 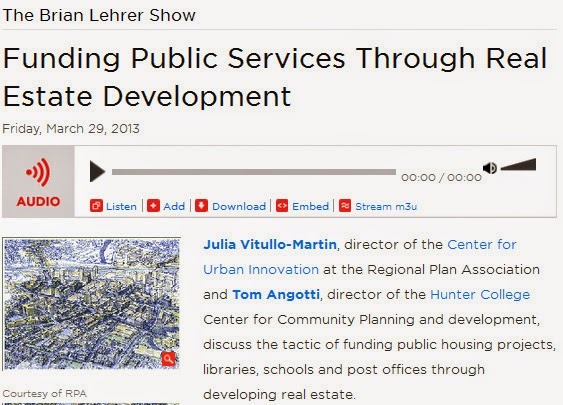 Schools, public housing, not just libraries, are being looked at to create real estate deals. For Hillary Clinton and New York City Mayor Bill de Blasio the issue is bigger than simply libraries. The sale and shrinkage of New York City libraries, although glaring, high-profile, and instantly easy to understand, is reflective of the sell-off and privatization of public assets in New York in general: Schools, hospitals, public housing, parks, landmarks and historic districts, even streets, avenues, sidewalks, and public gathering space. Two demonstrations and press conferences going on simultaneously at 11:00 AM on April 23rd blocks from one another and the Tillary Clinton Library, both to protest real estate industry attacks on public assets. One is for LICH a local hospital de Blasio said he would save as mayor, the other for Save the View Now about new buildings blocking the view from the Brooklyn Heights Promenade. In New York the principal driver of such proposed public property seizures is the monied real estate industry, so very powerful that commentator Bill Moyers recently devoted the entirety of one of his programs to describing that power and the damage it is inflicting on the public. On a national stage other monied special interests that benefit a privileged few at the expense of the many replicate the kind of influence the real estate industry has in NYC. It is important to recognize the root causes for the neglect of the public will we see when the public’s own priorities are sacrificed for those with influence. Addressing money in politics, election and campaign finance reform are long overdue needs. Most of us only get to vote once, but money in politics weighs in heavily, voting early and often spending mega-bucks galore in multiple districts at the same time. While we are in an era of increasing income and wealth inequality with the most affluent in our society lowering the taxes they pay, the really insidious issue is how the growing political inequality and the power that flows from these mounting economic disparities is being abused. 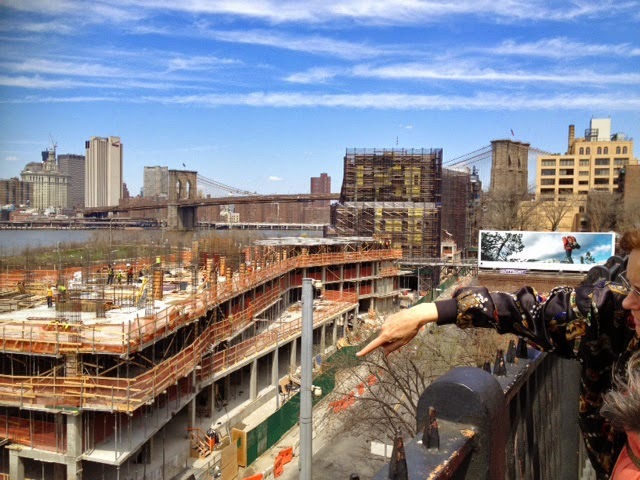 Save the View Now represents the community in objecting to how these buildings being built way taller than was supposed to be permitted block the view of the Brooklyn Bridge. There is a substantial overlap between the members of the arcanely structured Brooklyn Bridge Park Corporation who permitted this and the Trustees of the BPL selling libraries. In each case they treat the public similarly. In New York people are beginning to suggest, as on Brian Lehrer’s local public radio talk show the other day, that people may be ready to distance themselves from the real estate industry in view of the recent indictment of Albany leaders, Sheldon Silver, speaker of the Democratic Assembly until he was indicted and Dean Skelos, majority leader of the Republican state senate. That’s two out of three of the fabled “three men in a room” power triumvirate.. The third man in that room is Andrew Cuomo, who once worked in the Bill Clinton administration. Cuomo is already in trouble for peremptorily dissolving the Moreland Commission investigation that should probably itself had led to a version of these two other indictments. People are now wondering whether Cuomo will be the last of three men to fall. But as Harvard professor Lawrence Lessig (“Republic Lost”) and Pulitzer Prize-winning investigative journalist David Cay Johnston (“Free Lunch: How the Wealthiest Americans Enrich Themselves at Government Expense (and Stick You with the Bill)”) and a zillion others as well are noting, the real crime is not what is illegal, but what is getting defined as legal. And isn’t this rewriting of the rules we are all thinking about when Hillary says that the deck has been “stacked in favor of those at the top”? What Does Hillary Clinton's Campaign Mean for the Tillary Clinton Library? It has been suggested that the Brooklyn Heights Tillary Clinton Library won’t be torn down while the 2016 Presidential campaign is ongoing with Hillary Clinton’s campaign office right next door. All that heavy-duty construction destroying a library would be just too unseemly and distracting!. . . .
. . . The bigger issue is whether Mayor de Blasio can stand to let the demolition of the city’s libraries on his watch be the backdrop in a campaign where the foremost issue will be the subject of income inequality and the increasingly unfair advantages of the wealthy. It is, after all, a campaign in which Bill de Blasio as mayor of the city hosting Hillary’s campaign office is supposed to take a big part. Two items in a "pop-up" exhibit at the NYPL's 42nd Street Central Reference Library documented the gift that Andrew Carnegie made of libraries to New York City and the promise the city, including a prior NYC mayor giving thanks, made to properly fund those libraries and keep them open for the public. This week the New York Times editorial board expressed its opinion that de Blasio needs to restore funding to the libraries: New York City's Libraries Need Money, May 5, 2013. 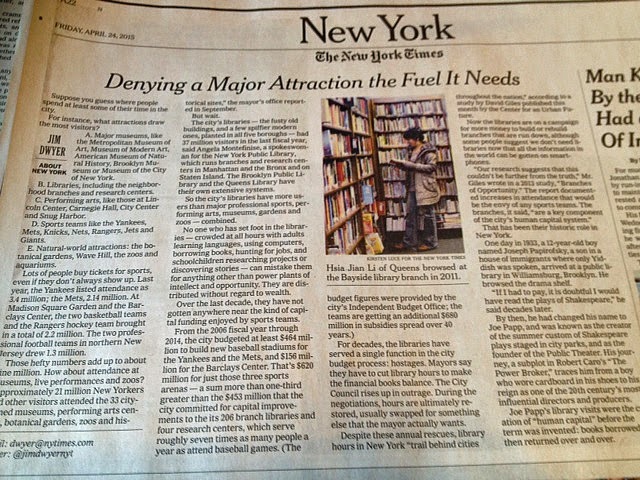 The Times editorial mentions columnist Jim Dwyer’s analysis (cited earlier here) of how while libraries were starved, money was diverted to the “seldom neglected . . . corporate and entertainment infrastructure,” specifically mentioning Dwyer’s identification of the “Barclays” center in that regard, that highly-subsidized arena owned by Hillary Clinton’s landlord Forest City Ratner together with a Russian Oligarch. 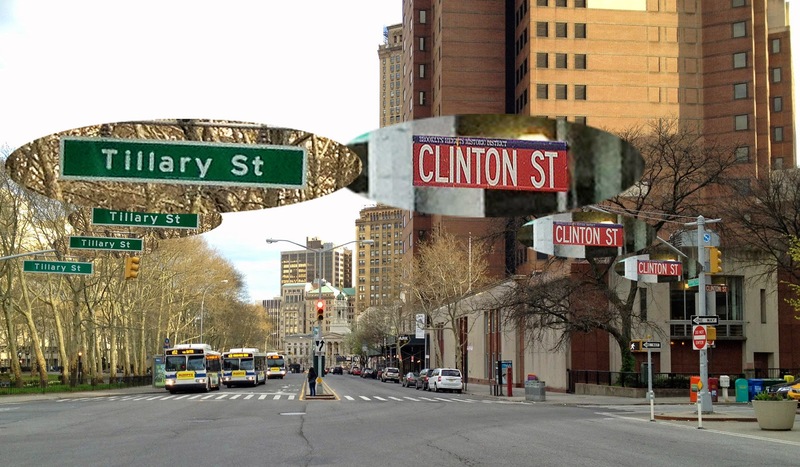 Although the Brooklyn Heights Tillary Clinton Library has always been a site for canvassing and demonstrations on the subject of library sell-offs, Ms. Clinton’s office adjacent location is probably destined to increasingly become a site that attracts all sorts of attention related to the campaign. Sunday, police barricades were set up outside the campaign headquarters door to contain a group of Tea Party activists. Our calendars tell us the 2016 campaign plays out for quite a while, until November 8, 2016, and even then there’s an aftermath. That takes Mayor d Blasio through two full New York City budget cycles and into the beginning of a third where he must focus on whether he will properly fund libraries as others are calling upon him to do, or let them be sold off and shrunk as symbols of his failure in that regard. Anyone predicting that this will not get a lot of national focus will probably wind up pretty chagrined. Don’t you think that people are going to be asking Hillary Clinton where she stands on the Tillary Clinton library issue?